The 3 sock yarns are all from Laughing Yaffle, I love her use of colour and who can resist the idea of sparkly rainbow socks? Certainly not me lol. I'm going to get on with some knitting now. 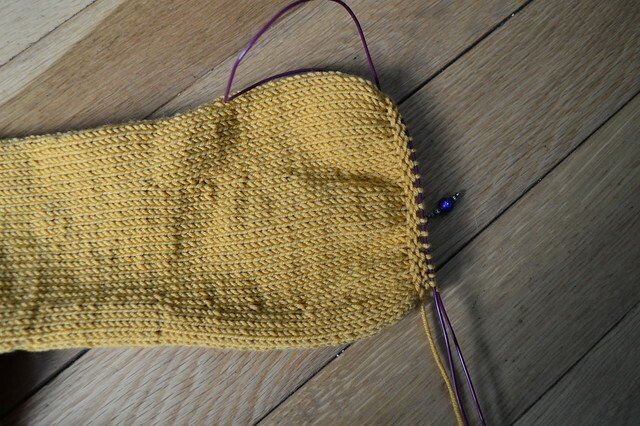 I've got this sweet little cuff to finish on my tully cardigan and then I've got to pick up stitches and do some short rows to shape the top of the other sleeve. I'd better be quick while my littlest girl has a short nap after a busy morning at pre-school. what great yarns! i love rainbow sparkles!! Happy B-day dear Evelyn, hope your day was filled with hugs, kisses and gifts:) Love your yarns, so strongly coloured, beautiful. Enjoy working wit them! The Mr. did an excellent job with the birthday presents! I hope you had a wonderful birthday and a fun year ahead. The sock yarn is so bright and vibrant! I love it! Happy birthday! Looks like you have a lovely bit of yarn to celebrate with. Happy belated birthday! What a great gift! 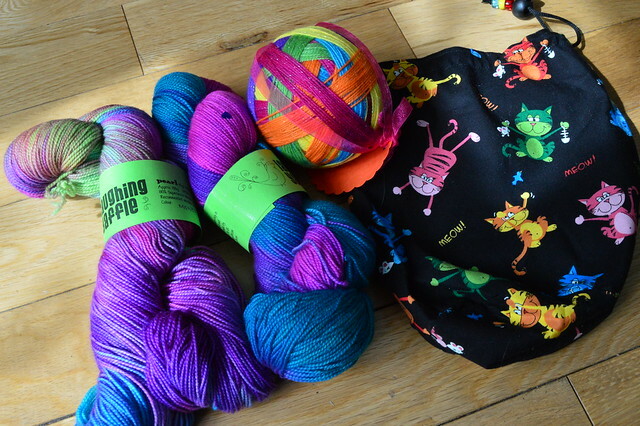 Happy birthday, those yarns are gorgeous and I love the cat bag! I took myself off of IG so I didn't get to see your birthday goodies until now. Fantastic job, Mr. Sheep! Are your entryway, living room, and dining room all separate rooms? Do you have a flow of color or you're picking paint by what you feel like? I've been spending days on the Sherwin-Williams website. Our home is ranch style and the entryway flows into the living room into the dining room which looks into the kitchen. Yes our lounge, kitchen and hallway are all separate rooms. We're not really going for a theme or flow of colour but I think we are both drawn to a certain palette of colours that go together. When we were looking at all the different greens you could get mixed up in the paint shop we both went for exactly the same one. I think now we've lived here almost 8 months we've got a feel for what colours would work for each room. Whether they need to be light or dark, warm or cool etc. Happy belated birthday! And what splendid presents! Happy Birthday! Enjoy your yarny goodness! Happy birthday! Yarn as a gift, what can be better?!! Happy Birthday. Your husband is very thoughtful to feed your creativity!